During a zombie Apocalypse the streets were not safe at night. For survival people need refuge from the zombies. 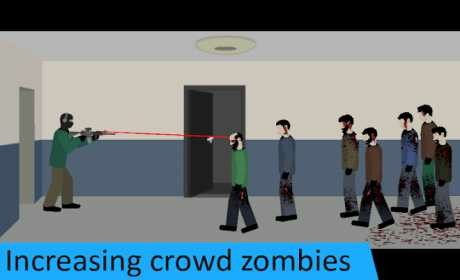 As a result, you were sent to cleanup the next building with crowds of zombies. How many corridors you can clear and survive against the zombie hordes? Don’t let the zombies approach to you. On you goes crowd of zombies. Use your weapon to kill zombies. Touch on screen to aim and shoot. You must shoot accurately and quickly, try to hold out as long as possible. At the beginning of the game you are given three lives – three attempts which can be bought to clean up the level. 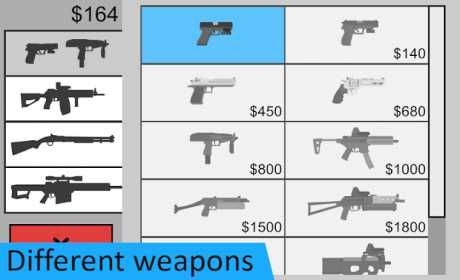 After all attempts will be used, you will lose all the weapons..
To select the different weapons you can deselect the selected weapon, for this click again on the selected weapon. In the game settings you can change the position of the buttons on the screen.